Giveaway #4: Sasha’s Magnificent Weddings Book & Beauty Products — Sweetchic Events, Inc. I have been a bad giveaway blogger! I have one more giveaway for the final week of Birthday month, so here we go! Last week I attended the Eventology Conference (more on that soon! ), and had the opportunity to learn from some of the best in the industry. 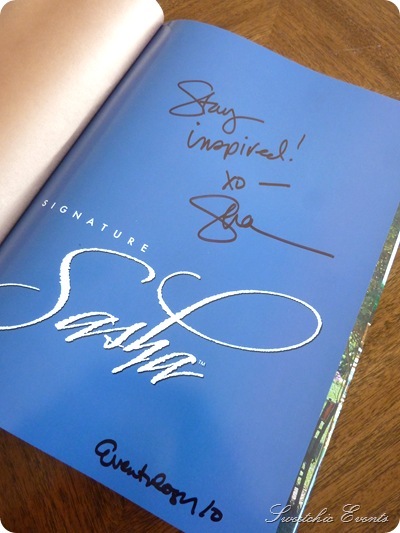 One of the guest speakers was celeb planner, Sasha Souza, and everyone was excited to received signed copies of her amazing book, Magnificent Weddings by Design. But I already have my own signed copy, so I am giving this one away to a lucky reader (retails for $50)! And I’m also including some fun beauty products in the mix, a Pixie Eye Beauty Kit in No. 15 (valued at $28) and H20 Aqualibrium sampler set! HOW TO ENTER: 1. Subscribe to the Blog via the RSS link AND comment that you subbed! 2. Join the Sweetchic Events Fan Page (If you aren’t already a member) and comment on my wall so that I know you joined! 3. Retweet this giveaway on Twitter and mention @SweetchicEvents 4. Do 1, 2 and 3 for more chances to win! Since I’m posting this later in the week than usual, this giveaway will be open until next Wednesday, May 5!